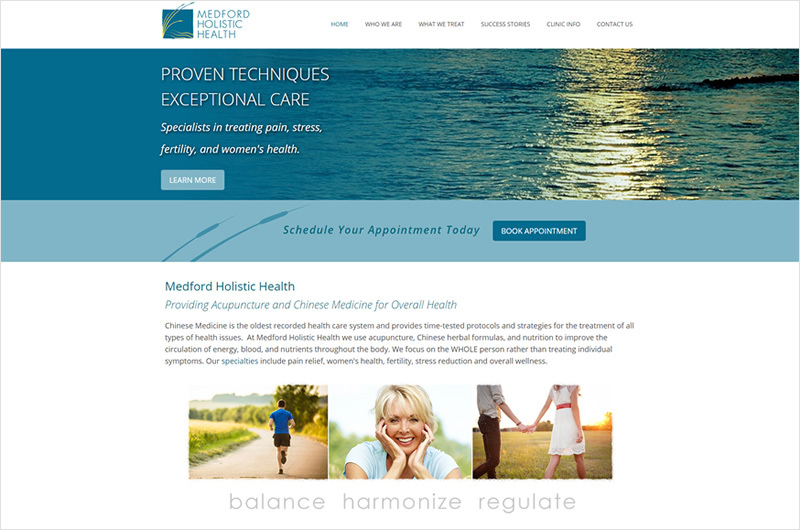 What an honor working with Jenn Collins, owner of Ashland Holistic Health, who along with fellow licensed acupuncturist Jenny Reigg have expanded to Medford. Their Chinese Medicine practice focuses on pain relief, women’s health, fertility, stress reduction and overall wellness. Their website presence is soothing, informative, and includes poignant client success stories. Working with Erin Muck and Ruby Slipper Designs was such a great experience. Our meetings were fun and Erin was able to really grasp what I wanted in a website and create it almost intuitively. I wanted a clean, modern, relaxing and welcoming site, and Ruby Slipper Designs nailed it. She also helped me think about the future and chose details that will enhance the performance and longevity of my site.